The July 2015 California Car Cover features a custom 1961 Volkswagen Split Window Bus built by SicChops. 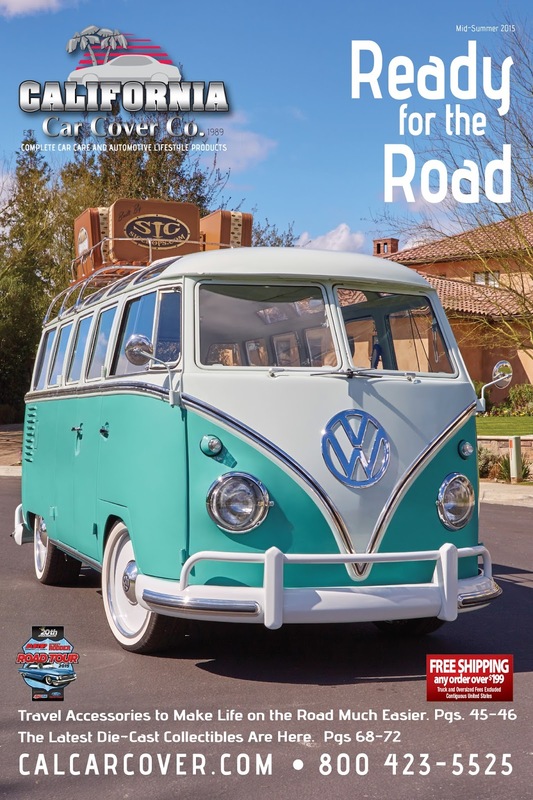 We spotted this custom VW at the Grand National Roadster Show earlier this year and knew it would be the perfect vehicle for one of our summer catalog covers. The Volkswagen is owned by AJ and Kate Bos of Bakersfield, Ca. The bus has fully restored by SicChops and they did an amazing job of restoring it and giving it some custom touches. The exterior is factory silver white paint with a custom blue and turquoise mix. It features a custom set of one-off Colorado Custom Wheels and narrow white walls by Diamondback Classics. The VW bus received a custom interior by Ron Mangus. The Bos' family and SicChops would like to thank Ron Mangus, Colorado Custom, Diamondback Classics, Douglas Interior Supply and California Chrome and Polish for their assistance on this build. Above is the July 2015 California Car Cover catalog cover.